At the regular lodge meeting of Tarleton Lodge No 7871, at the Park Hall Hotel, Charnock Richard, the brethren gathered to celebrate 50 years in Freemasonry for Eric Alfred Price. Frank Umbers (left) presenting Eric Price with his Jubilee certificate. The lodge was honoured by the presence of Assistant Provincial Grand Master Francis (Frank) Umbers, who was accompanied by Ormskirk and Bootle Group Chairman Graham Chambers, the group vice chairman Malcolm Alexander and other distinguished brethren, who along with 17 other brethren and guests enjoyed a very interesting and enlightening evening. Frank Umbers instructed the Provincial Assistant Grand Director of Ceremonies Jason Dell, to present Eric to him, which he did. Frank then gave a resume of Eric’s life and Masonic career, supplementing the talk with historical facts, appertaining to various stages in Eric’s life, which were both humorous and informative. 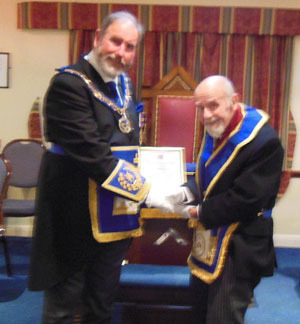 On the conclusion of this resume Frank presented Eric with a framed jubilee certificate from the Provincial Grand Master Tony Harrison, congratulating Eric on his golden jubilee in Masonry. Eric grew up in Burscough where his family ran a potato seed and supply merchants. He was initiated into Tarleton Lodge and has maintained his membership for his entire Masonic career. He moved to Devon with his wife some eight years ago and is a member of Loyal Lodge No 251 which meets in Barnstable and is at present the 277th WM of that lodge. The lodge meeting was followed by an excellent festive board enjoyed by all at which the WM Colin Mills presented Eric with an engraved ‘Masonic’ wrist watch, on behalf of the brethren of the lodge, as a memento of his achievement and that they are sure will bring back memories of this occasion each time Eric wears it.